At ARIES, we know what it means to be a Jeep Wrangler owner. We know that the sky is your roof, the rocky slopes are your bread and butter, and the mud in your tires is the blood pumping through your veins. ARIES Jeep Wrangler accessories are inspired by the passion you have for going off the beaten path. We offer unique Jeep accessories that are custom-engineered for the Jeep JL, Jeep JK and Jeep TJ. Our products are built for trail-readiness and aggressive style, letting you customize your Jeep Wrangler for the ultimate offroad experience. The TrailCrusher® bumper for Jeep Wrangler is a highly tested, offroad-ready bumper with standard winch and shackle mounts. Its one-piece construction and exceptional weight ratings give you functionality on the trail, while its angular design and stinger brush guard offer an aggressive look. The TrailCrusher® Jeep bumper is available for the front and rear, and both install with no drilling required. 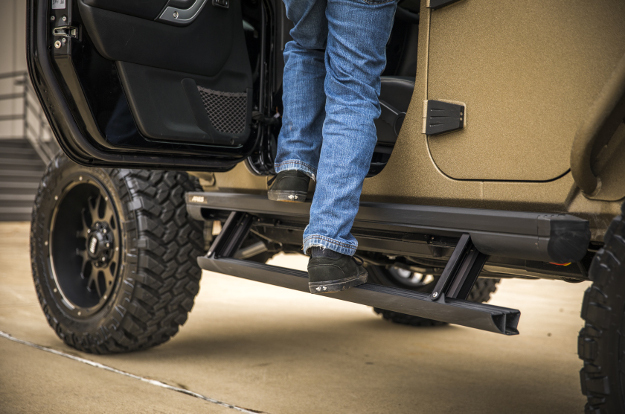 The TrailChaser® Jeep bumper features a modular design that provides a variety of different configurations, allowing you to select the look that best fits your custom Jeep build. Bumpers are available with integrated lights, multiple brush guard options and more. TrailChaser® bumpers for Jeep Wrangler are available in powder-coated steel or aluminum for the front and rear. 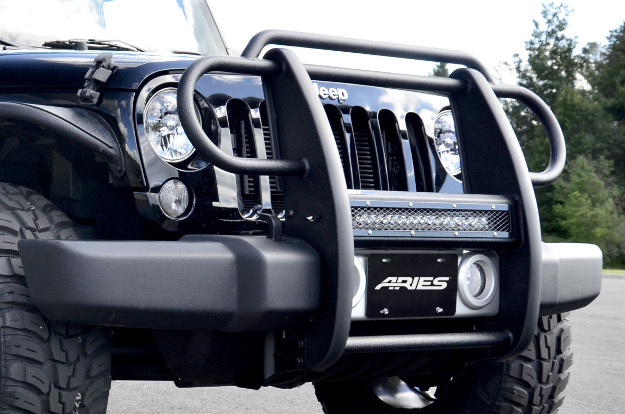 ARIES Jeep grille guards provide a unique, vehicle-specific fit for the Jeep Wrangler, featuring rounded side brush guards, a one-piece design and custom mounting points to securely bolt onto the frame with no drilling. We offer standard grille guards for the Jeep Wrangler as well as a Pro Series™ grille guard with a patented, integrated LED light bar housing and interchangeable cover plates for easy customization. ARIES offers several different options for adding LED light to your Jeep Wrangler. Choose from light mounting brackets for the roof, hood, windshield brackets and more to add square work lights or LED light bars to your Jeep. All ARIES Jeep Wrangler LED light mounts come with a durable powder coat finish and install quickly and securely with no drilling required. 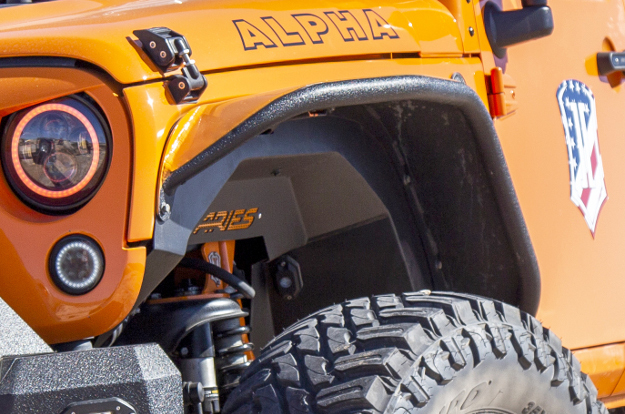 Give your Jeep Wrangler the offroad edge with ARIES Jeep tube doors. These offroad-style half doors are designed to open up the Jeep Wrangler and connect you with the trail. They are easy to install and remove as needed. ARIES Jeep Wrangler tube doors are also constructed from powder-coated aluminum, making them highly resilient to all of the outdoor elements. ARIES Jeep fender flares equip your Wrangler for the trail, featuring a narrowed width to better show larger, offroad tires. They are also constructed from powder-coated aluminum to be highly resilient to the elements. We also offer inner fender liners to complement our fender flares. These Jeep Wrangler accessories mount on the inside of the fender and provide better protection for the engine compartment, compared to factory flares. They also feature powder-coated aluminum construction. ARIES Jeep side steps and running boards are engineered for a custom fit on the Jeep Wrangler, installing with no drilling required and providing a solid first step on your adventure. Our ActionTrac™ powered running boards are particularly suited for lifted and offroad-style Jeeps. They have a patented step-within-a-step™ design, an integrated control module and a powder-coated aluminum construction. 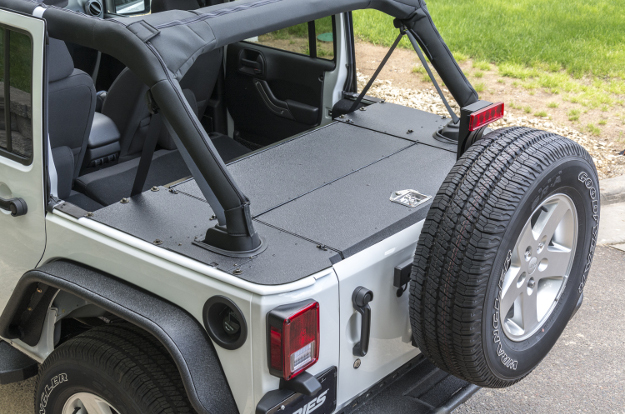 The ARIES Jeep security cargo cover turns the rear cargo bed of your Jeep Wrangler into a fully enclosed, lockable storage space. It's ideal for keeping your items safe and protected when you're on the trail or just leaving your Jeep unattended. The security cargo lid is made from powder-coated aluminum construction to easily withstand the outdoor elements. It installs with no drilling required and is compatible with the hardtop, soft top and subwoofer. 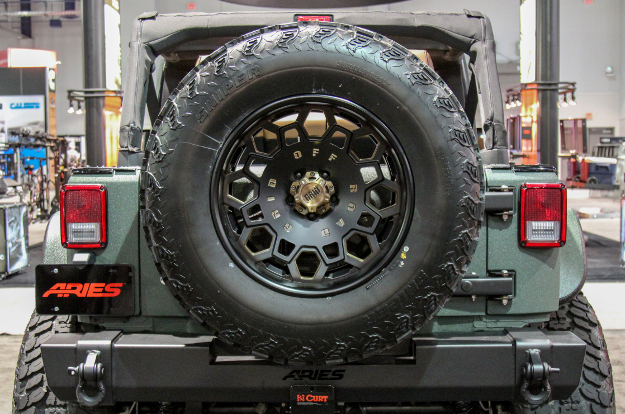 Larger tires are a must-have for an offroad Jeep Wrangler, and as such, ARIES offers spare tire carriers uniquely designed to accommodate offroad tires. Our Jeep heavy-duty spare tire carrier features an adjustable design to accept tires up to 37" in diameter. 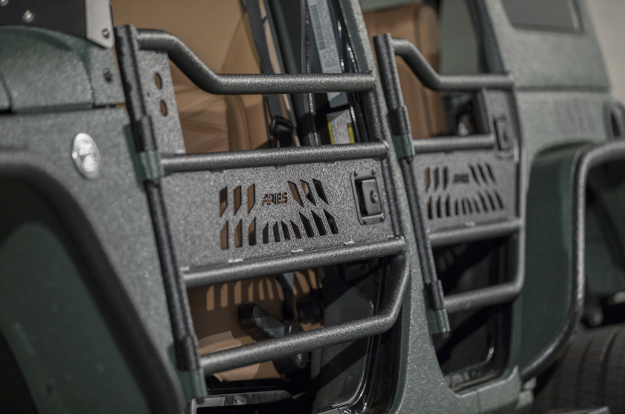 It is also engineered to replace the factory hinges on the rear Jeep door with high-strength hinges. We also offer a fixed spare tire carrier for tires up to 35" in diameter. 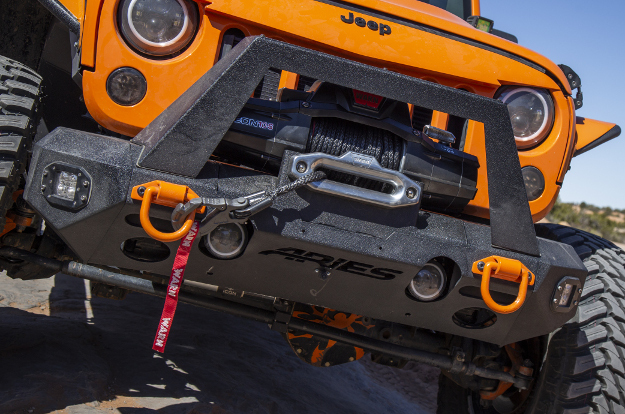 Add tow hooks and winch capabilities to your offroad Jeep with ARIES Jeep Wrangler accessories. 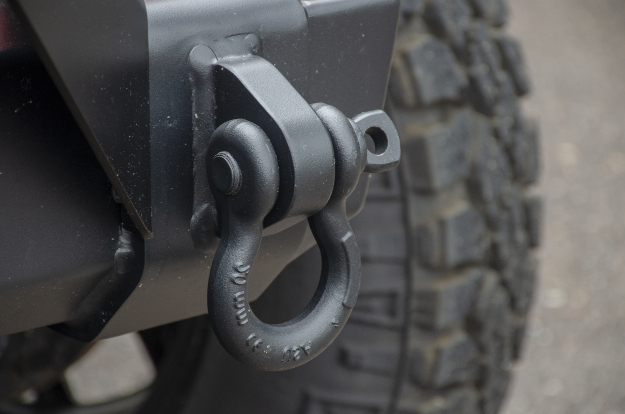 Our tow hooks, D-rings and shackles are designed for an exact fit on many of our TrailCrusher® and TrailChaser® Jeep bumpers. They can also be used for a wide variety of other Jeep applications. 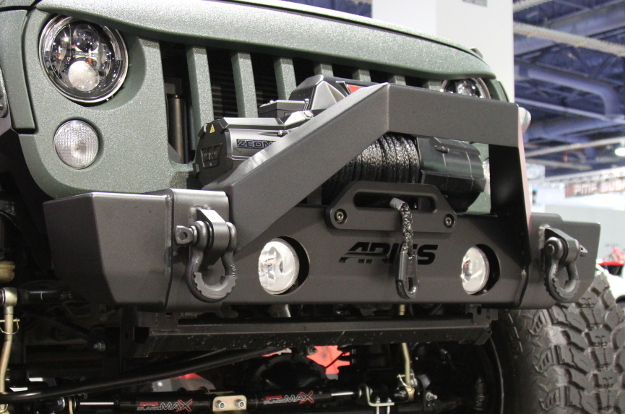 We also offer winch accessories for our Jeep bumpers, including hawse and roller fairleads and fairlead brackets.